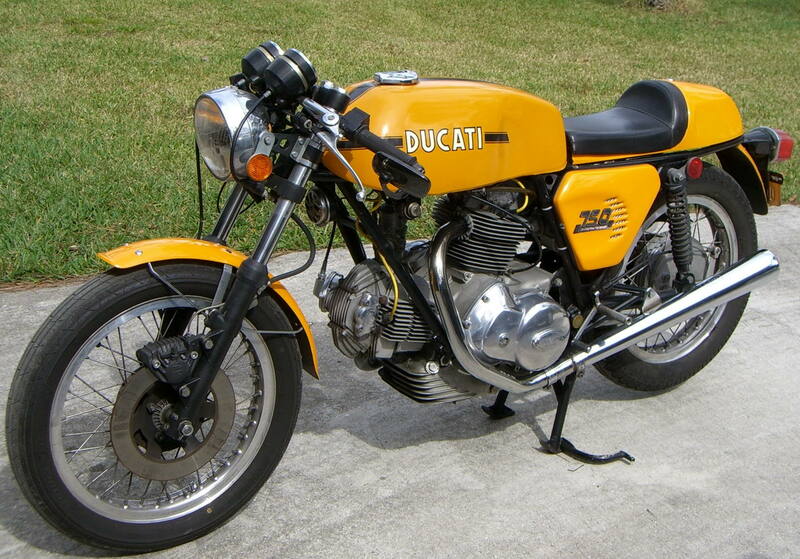 The 1972-1974 Ducati Sport was a café-racer style motorcycle, not race bike. The 750SS was much more track oriented. I originally bought my 1974 Sport to be my street bike. However, through an unusual set of circumstances, it became available for track use, and I modified it to race in the AFM’s 750 Production class in 1976. I ended up winning the class title, and more importantly I impressed Dale Newton enough he asked me to race his bikes. That was my big break and made my AMA National successes possible. The Ducati 750 Sport was not a Desmo motor but had conventional coil valve springs. It came with low clip-on handlebars, high rear-set foot controls, and a bum-stop solo seat, quite different styling than the 750 GT. But the Sport motor was nearly identical to the GT. The two exceptions were a slightly domed piston that gave 9.5:1 compression instead of the 8.5:1 compression of the flat-top GT pistons, and 32mm Dellorto carburetors with open velocity stacks instead of the 30mm filtered carbs of the GT. Like any street bike it needed modifications for the racetrack. A standard late 1974 Ducati 750 Sport like mine. This owner has added a bar-end mirror on the left clip-on. My Sport was raced twice in 1975, once at Ontario and once at the Sears Point 3-hour endurance race. At both of those races the only major modification was the high rise headers, number 2 below, but I got busy during the winter making these other modifications. Here are the top five modifications I made to my Sport when I raced it in the AFM in the 1976 season. The 750 Sport and the 750 GT both came with an 18-inch rear wheel with a WM-3 (2.15 inch) rim and a 19-inch front wheel with a WM-2 (1.85 inch) rim. The 750SS, in contrast, had 18-inch wheels on both ends. There were very few choices of racing tires in the 19-inch size, so I wanted an 18-inch rim on the front. I figured the 750SS had 18-inch wheels front and rear and since the Sport had the same frame it could take the 18-inch front without making the rake and trail too weird. I installed bigger rims as well, putting a WM-3 rim on the front and a 2.5 inch rim on the rear wheel. Don’t ask me why, but there was no formal WM size designation for the 2.5 inch rim, but I thought of it as a WM-4. Changing rims was legal in AFM Production rules as long as I kept to the standard spoke-laced wheels. After lacing up the new wheels I safety-wired the spokes where they crossed. Some folks claimed that made the wheels stronger, less likely to flex under load. I’m not sure about that, but if a spoke did break it would keep it from flaying about. After changing the wheel size the stock front fender looked, well, odd. I replaced it with a replica of the 750SS fender, probably not fully legal under the Production rules, but nobody seemed to care. With the replica fender painted the bright ocher color of the Sport it looked correct. I used Goodyear racing slicks in 1976. Racing slicks were a radical idea when they first appeared in the early 1970s. Many people felt that a tire had to have some tread to work. Kenny Roberts and other top road racers quickly adopted the slicks because on long distance races they wore the tread nearly off and the tires worked fine. They thought the more rubber on the road the better. They were right. Besides, Cook Neilson and Phil Schilling had used Goodyear slicks on Overdog, their 750SS when it was still 750cc’s, in 1975. The Ducati took to the slicks well but other bikes, especially the Kawasaki Z1, did not. The Ducati frame was very strong and stiff (the damn thing was about 60 pounds of Italian water pipe) and could handle the extra grip the slicks provided. The powerful Japanese bikes’ frames were not so well designed – most were based on the Norton featherbed frame, which was a great frame for a 500cc single, but not so great for a 905cc in-line four. The extra grip of the racing slick would flex the frame which resulted in rather creative and unpredictable handling. Until the mechanics figured out how to re-enforce the frame the bigger Japanese bikes had to stay with treaded tires. It wasn’t long, however, until they figured out how to stiffen the frame enough to allow them to use the slicks. The bracing didn’t totally stop the flexing but kept it small enough to be rideable. The Ducati still handled better, especially on bumpy sections of track. Memory is a tricky thing, but I recall that I used the same size tires on the Ducati as was used on the Yamaha TZ250 racers. That makes sense considering that the Yamahas made more horsepower but the Sport was heavier. All the Ducati twins had low-mounted header pipes leading to the Conti silencers. These header pipes would drag pretty quickly in the turns. The 750SS came with a race kit that included some high-rise header pipes that allowed much greater lean angles before anything touched down. The Ducati Sports were never sold with a race kit, so using the 750SS-style headers on my bike was probably not actually legal, but the bike couldn’t really be raced without them. Anyway, nobody protested so many Ducati racers got away with it. The header pipes curved around and up so the Conti could be turned upside down and mounted to extensions bolted to the frame. Heat-shields were needed to protect my ankles. The low headers had a cross over pipe just behind the oil sump while the high rise header’s cross-over went just past the rear carburetor, very close to the battery. The triangular side panels mounted to the stock bike had to be removed, another item that skirted around the edge of the official AFM Production class rules. There were other parts that touched pavement once I got good enough to really lean into the corners, and I adjusted the shift and brake levers, bending them in as far as I could while leaving them usable. The little rubber bits that covered those levers got a nice beveled angle worn into them. Although I never leaned the Sport over that far, when I raced Dale’s bikes I would sometimes scrape the bottom of the clutch cover and the end of the oil drain bolt. 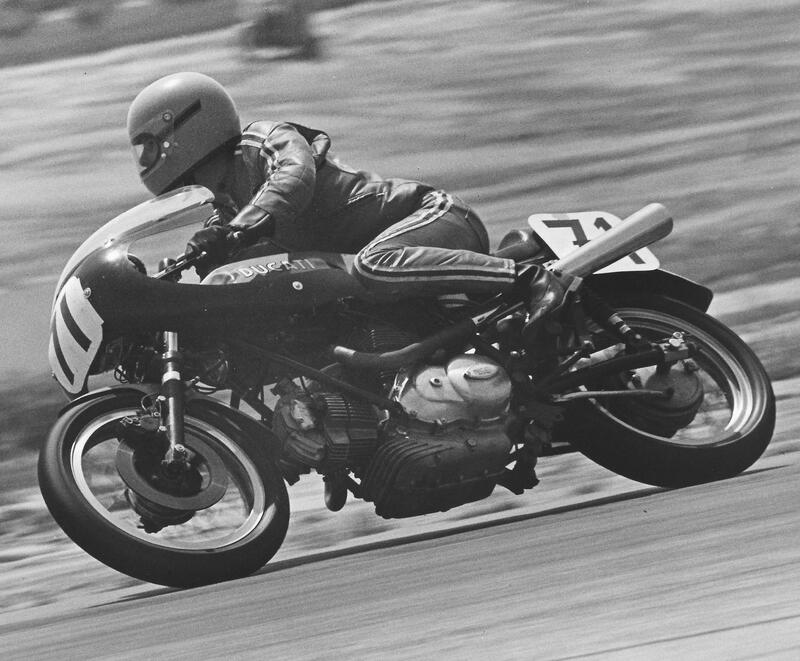 Once, at the 1977 AMA National at Sears Point I actually scraped the crankcase in turn 9. After that I started leaning off more. A nice rounded off rubber cover at the end of the shift lever, courtesy of the race track. Note the bend to the shaft to tuck it in as much as possible. A few of the first Ducati Sports were sold with a half-fairing. It looked like an afterthought because the headlight still turned with the forks – the fairing had a large oval clear bubble on the front to allow the light through so you could ride after dark. Not clever. No matter how clear the plastic bubble is it will reduce the amount of light hitting the road. The 750SS had the headlight properly mounted in the fairing. The 1974 model Sports were not sold with a fairing, but because some of the early ones were, the fairing was legal for AFM Production. There were some U.S. aftermarket suppliers who sold replica 750SS fairings, so I fabricated some mountings and installed one. There was nothing wrong with the Ducati Sport rear shocks but instead of the stock 300mm (about 12 inches) shocks I switched to 330mm (about 13-inch) shocks. The raised rear end quickened up the steering a little and increased ground clearance a tiny bit. Aftermarket shocks were legal in AFM Production. The pistons in the Sport and the 750SS were higher compression than the 750 GT. As I recall the Sport and SS pistons were made by Mondial while the GT pistons were from Borgo. Anyway, under racing conditions the Sport would commonly break the top piston ring. After replacing the rings for about the third time I asked Phil Schilling what they did when they were racing Overdog, their 750SS when it was still 750cc. He said, “Use the rings from the GT.” So I ordered a set of 750 GT rings and they worked. No more broken rings after every race. A photo of the fully modified Sport at speed, probably at Sears Point. Compare this to the photo of the stock Sport, above. There were other really minor changes to make the bike a good AFM 750 Production class weapon, but these five items were the most important modifications I made to the Sport. Thanks Paul, an enjoyable read. Good stuff Paul! Did you ever compare the rev range on a SS Vs. a Sport? Just wondering the advantage a Desmo would have. I really enjoyed riding my friend James’s Sport. At 6’1″ I fit on it well and I loved the sound of the Conti pipes. That rear tire on your racer looks like the standard rear Metzeler on my 860 GTS. What size of tires did you have on that racer? Kjell, I wish I could remember, but I don’t. It was 39 years ago and I have a touch of CRS disease. ;-).